Weekends and pizza are the perfect combinations. 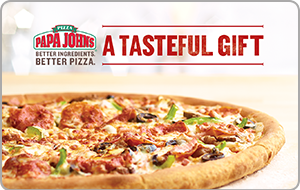 Buy a Papa John’s gift card at a discounted price and pay less money for your next pizza night! Whether you prefer classics such as pepperoni, mozzarella cheese, and sausage or more unique pizza twists like Philly cheesesteak or spinach alfredo, you will pay less on your entire bill! What’s not to love about saving money on an American favorite? Offering a variety of toppings and crusts to choose from, Papa John’s has something for everyone. Not in the mood for pizza? No problem! They also have baked chicken wings, breadsticks, chicken poppers, desserts, drinks, and more! Buy a discounted Papa John’s gift card, and save money on your entire bill. What’s more, they have specials every day of the week! Pizza night has never been so affordable! For over 30 years Papa John’s has been delivering steamy fresh pizzas to neighborhoods across America. And with more than 4,500 locations, finding one close to you is easy! Buy your discounted Papa John’s gift card today and pay less money for your favorite style pizza. Whether you want to carry out or delivery, the savings are just as fantastic! What better way to feed your hungry group than with pizza? Get your card today and enjoy the savings! Are you planning a party or team event? If so, a discounted Papa John’s gift card might be the perfect solution! Same crowd-pleasing food, for less money out of your wallet! And if you want to save more money every day, then be sure to check out our listings for Domino’s Pizza, Little Caesar’s Pizza, Pizza Hut, Cici’s Pizza, and more! With Cards2Cash, you can enjoy delicious, hot pizza without breaking your budget! Cards2Cash will buy your Papa John’s gift card! If you have a gift card, you will never use then why not sell it? We buy gift cards to many favorite restaurants and retailers. And the best part is, we pay top dollar for them! Why hold on to a piece of plastic when instead you can have money? Stop in one of our retail locations where we will pay you on the spot for your card, or fill out our online form and we’ll get back to you with an offer! Cards2Cash is your answer to saving money!